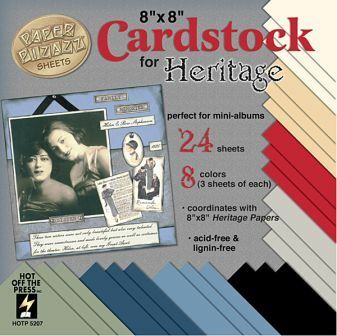 Heritage cardstock—a perfect match! Designed to match the patterned papers in the Heritage Papers collection. This pack contains 24 sheets of 8”x8” double-sided textured cardstock in a rainbow of 8 vintage-look shades. You’ll have 3 sheets of each color: sage, white, cream, red, pearl and more.